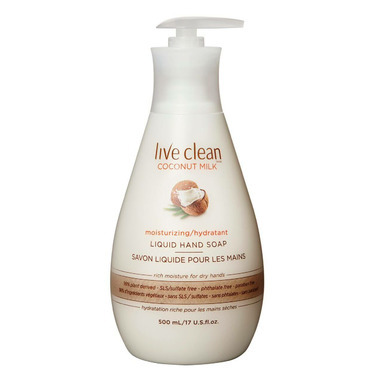 Live Clean Coconut Milk Moisturizing Liquid Hand Soap rich creamy hand soap hydrates and restores moisture balance and softness to hands. Features luscious coconut milk from the tropics and is heavily enriched with vitamins C, E, B as well as additional minerals & protein to cleanse nourish and hydrate skin. Love this hand soap and so does my daughter. Gentle on the hands and one pump gives a very thorough hand wash. Coconut scent is very gentle and pleasant. Am buying lots more for the bathroom and kitchen sinks. I like all of. Live Clean hand soaps and shower soaps. I donâ€™t like anything with argan oil whih is in the lotions...too powerful a scent. I like the consistancy of the hand soap, also. My favourite soap. Smells great. I like all the Live Clean soaps and this is no different. Love the smell and feel. Boys like it too. Iâ€™m a big fan of Live Clean products but this soap is my least favourite product by a long shot. I have sensitive skin and after using this soap my hands immediately feel so dried out that I have to put cream on. The scent is so mild its almost non-existent. Will keep your hands clean and soft! Smells great and a little goes a long way! I love the smell of this soap and it works great too! Plus it's all natural! This soap smells so good and is great to use in the winter in Alberta, where the air is dry. Love the Live Clean brand! Staple in our home. I buy Live Clean products because they are paraben free, as well as other things. Having highly allergic family members, this soap has been a blessing!! Very easy on your skin, and great scent. One of absolute favorites! Love the smell and the fact it is not laden with chemical like many other hand soaps on the market. Thanks Well for carrying this soap and at such a great price! I have tried so many types of hand wash and this is my favourite by far. The scents of all are lovely and the fact they are really 'Live Clean' is a real bonus. After years of searching for a great soap to use in our washrooms, we've settled on this one. It's creamy and moisturizing, it smells great, and washes off cleanly. It leaves our hands from drying out. We only wish it were available in a refill format! The Live Clean hand soaps are great! This is my favourite scent and the soap doesn't dry out my hands. I also like the large size. Pleasant scent and very moisturizing. Great hand wash! Smells fresh, clean ingredients and keeps hands soft after using. I really like this product . It smells wonderful and is very thick and moisturizing unlike some soaps which are like water. Smells amazing and is so moisturizing. The first package was leaking when I received it. Well is great and is sending me another. I love their service. Love this hand soap. Love the scent and it leaves your hands feeling moisturized not dried out. I always buy my hand soap from bath and body, but now I will buy live clean. Leaves my hands soft and not dried out. The coconut milk scent is subtle. Lasts longer then the other brand, and no harsh chemicals. I will definitely buy again. Love the soap. Excellent scent - not too strong. Easy to lather and rinse off. Amazing product for my extremely dry and sensitive hands! No more cracked skin even if I don't apply heavy hand creams after washing! And the coconut scent is lovely too! LOVE the smell! It seems to moisturize my hands at the same time! Perfect for winter time! I used to buy another eco- friendly hand soap that was the same price for a bottle half the size. Conscious of using a lot of plastic, I like that this bottle is an economical size, it really does smell amazing and I feel confortable washing my toddlers hands with it. This hand soap smells amazing! It is moisturizing and I love that it feels thicker and not watery like some soaps. Leaves your hands soft and smelling nice! Moisturizers and cleans at the same time! Perfect for my super dry hands! Will definitely repurchase. I love all Live Clean hand soaps, but this one is by far the best one. My hands stay very soft, i don't need to put as much hand cream on as I usually would. And above all, it smells gorgeous. This is another fantastic hand soap by live clean. It really is gentle and moisturizing on the hands which is critical for me since I am a therapist and I wash my hands before and after every client that I see. I've had problems with my hands cracking when I've used harsher and/or antibacterial soaps, and have found more of the "chemically" based soaps to really burn my skin, so I'm particularly choosy now more than ever about what I put on my hands. CLEANS AND MOISTURIZES as expected...natural and Canadian (rarely this happens)...will buy again! Love this hand soap, it smells great, cleans well, and really moisturizes! !